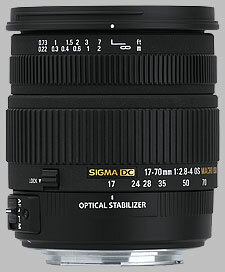 The Sigma 17-70mm ƒ/2.8-4 DC Macro OS HSM was released at the end of 2009, updating the previously unstabilized ƒ/2.8-4.5 version of the same lens. The lens is designed to be used on APS-C sized digital sensor bodies only; users of full-frame cameras will encounter hard vignetting at all focal length settings. The Sigma 17-70mm ƒ/2.8-4 DC Macro OS HSM ships with a lens hood, takes 72mm filters and is currently available in Sigma, Canon, Nikon, Sony and Pentax mounts for approximately $450. When used wide open (ƒ/2.8) at its widest aperture (17mm), our evaluation lens showed slightly de-centered results, but fairly good performance: a large central sweet spot of sharpness in the range of 1-1.5 blur units, tapering out to slightlly soft corners in the range of 2-3 blur units. Zooming out things get a little better, especially in the 23-35mm range, where the sharp sweet spot gets larger and there's little corner softness to speak of. At 50mm (we're at ƒ/4 as a maximum aperture at this point) we encounter de-centering again and some degradation in the results: our sweet spot has moved to the ''southeast'' of the frame, and while it's a fairly good area of sharpness, corner softness has increased, again showing 2-3 blur units. Performance is comparatively poor at 70mm: de-centering has moved the area of sharpness to the extreme lower right corner, and sharpness is generally around 2 blur units across the frame. Stopping down improves sharpness for this lens, but it never produces tack-sharp results across the entire frame. Stopping down to ƒ/5.6 produces the ''sharpest'' images until 50mm and greater, where you need to stop down to ƒ/8 for the best performance. Fully stopped-down, the lens produces mediocre results: 3-4 blur units at ƒ/22, all the way to 5 blur units at ƒ/32 and 70mm. CA is quite well-controlled in the Sigma 17-70mm ƒ/2.8-4 OS, showing up only slightly in the corners of the 17mm focal length setting, in areas of high contrast. There's no practical difference between aperture settings, but according to the numbers, you get slightly less CA when using the lens at wider aperture settings (ie., ƒ/2.8 instead of ƒ/22). Corner shading isn't a real problem for this lens, with slight shading visible only when the lens is used at its widest aperture settings. The most prominent light falloff is visible at the 17mm focal length setting (at ƒ/2.8), where the extreme corners will be a half-stop darker than the center. At other focal lengths the differential is around 1/3EV; stopping down to ƒ/4 or smaller, corner shading disappears below the quarter-stop differential. When used in the wide angle configuration, the lens provides uniform barrel (''bloat'') distortion up to around 21mm, with noteable distortion in the corners at 17mm (+0.75%). After 21mm, distortion across the frame remains consistently barrel-distorted, but at a moderately low level (around 0.2%, on average) and the extreme corner distortion turns into the pincushion (''squeeze'') style. The worst results are seen at 34mm and greater, where the corners show almost -0.5% pincushion distortion. Post-processing would be required to correct for these effects. The Sigma 17-70mm ƒ/2.8-4 OS employs Sigma's HSM technology, which allows for fast and quiet autofocusing. Indeed, the lens was able to focus between infinity, close-focus and back to infinity in around one second. Attached 72mm filters won't rotate during focus operations, and there is no lens extension either. Sigma has qualified the 17-70mm ƒ/2.8-4 OS as a macro lens, though it can only achieve 0.37x magnification (1:2.7 reproduction) at a minimum focusing distance of 22cm (just under 9 inches). The Sigma 17-70mm ƒ/2.8-4 OS uses largely plastic construction, however at 535 grams (18.9 ounces), the lens is quite a handfull: used with an APS-C sensor body, the camera/lens combination becomes slightly front-heavy. The lens is finished with an all-black matte texture that is very tactile and easy to grip. The lens mount is metal; the filter threads are plastic. There is a distance scale etched onto the focus ring, marked in feet and meters, and there are macro reproduction ratios marked on the lens barrel, visible when the lens is zoomed out (and the lens extends). The lens has a few control switches. One switch enables or disables autofocus; the second enables or disables optical stabilization. There's also a zoom lock switch to keep the lens at 17mm, though in our casual testing we didn't note any zoom creep that would warrant the switch (though perhaps over time, the zoom lock switch could be useful to have). The zoom ring is rubber with raised ribs, approximately 3/4 inches wide. The lens extends as it is zoomed in towards 70mm, growing 1 5/8 inches in length. The ring is smooth to turn, nicely cammed, going from 17mm to 70mm with a 75-degree turn of the ring. The focus ring is also rubber with raised ribs, about 3/8 inches wide. The ring only provides about 45 degrees of turning action, making it slightly challenging for manual focus operations, but providing for faster autofocus speed. The focus range ends in hard stops on either end. The lens hood is petal-shaped and can be reversed onto the lens for storage. When attached, the lens hood adds 1 3/4 inches to the overall length of the lens. We didn't perform extensive testing of the optical stabilization system for this lens, but we did find that its implementation made it difficult for us to conduct our lens testing. 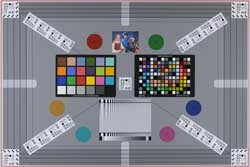 It's noteworthy that the optical stabilization system is always active in the optical design of the lens, even if it's turned off: we noted that even in manual focus, with the OS system set to off, the OS system moves its elements into position when the meter is activated, and it doesn't move them into the same place every time. Thus, while it probably won't have an impact on practical photography, if you're a macro shooter, you may find large inconsistencies in manual focus performance. The actual effectiveness of the OS system, in contrast, is fairly good, providing (anecdotally) 2-3 stops of hand-holding stability. While the older version of Sigma's 17-70mm doesn't have the same aperture capability of the new version or optical stabilization, it produced markedly sharper images - though it could be that there are sharper copies of the 17-70mm OS we tested. CA resistance is a little better, distortion is a bit lower, but corner shading is a bit higher. Macro performance is also a bit better and the whole package weighs a bit less; it's also a little less expensive. There are actually several options to choose from in the Canon line (such as the 17-85mm ƒ/4-5.6): in this case, the Canon 15-85mm is definitely sharper, though it doesn't have quite the same aperture capability (ƒ/5.6 at 70mm versus Sigma's ƒ/4) though it could be said that this enforced stopping-down is what keeps the Canon sharper. CA resistance and distortion are about the same, though corner shading is slightly more prominent in the Canon. Similar to Canon, there are several options to choose from in the Nikon line (such as the 18-105mm ƒ/3.5-5.6 VR): in this case, the Nikon 16-85mm is sharper than the Sigma, though (again) it doesn't have quite the same aperture capability. CA resistance is much better in the Nikon. Distortion is about the same, though corner shading is slightly more prominent in the Nikon. Pentax bodies are image stabilized, so the lack of image stabilization isn't noteworthy here. The lens uses a constant ƒ/4 aperture compared to Sigma's variable aperture; it's much sharper used wide open than the Sigma. Chromatic aberration is somewhat problematic at the wide and tele ends of the focal range, much more so than the Sigma. Corner shading is less pronounced on the Pentax, and distortion is similarly complex. There are a few Sony options in this category, with OS not being an important consideration as Sony bodies are image stabilized. The Sony is generally sharper than the Sigma, though CA is more noticeable on the Sony at 16mm than the Sigma at 17mm. Corner shading is about the same on the Sony, perhaps a bit more prominent at 16mm, and distortion is similar between the two lenses - perhaps a bit more forgiving on the Sony. Given the price point and intended market, the Sigma 17-70mm ƒ/2.8-4 OS performed quite well. Good performance for sharpness, excellent resistance to chromatic aberration, low corner shading - the lens has test results which commend it. Many users may be tempted in by the ''faster'' aperture performance offered by the lens - ƒ/2.8-4 versus ƒ/3.5-5.6 of most kit lenses - though at 50mm and longer, they may find that they must stop down to achieve the sharpest images. Like the other Sigma lenses I've owned, this lens feels sturdy and very well built. The 72mm filter size means the filters are not too pricey. The official minimum focus distance is listed as 8.7" but as others have stated, that value must be from the sensor and not the lens for I am able to focus on objects 2" away from the lens (e.g. see the photo of the bug on the flower at the link above). Image quality seems outstanding. The first image at the link above (the cat with its tongue out) is resized down to 1600 pixels but is otherwise untouched. The detail at 70mm, f/8 and 400 ISO is outstanding in my opinion. Focusing is quite fast and accurate I have found. My only beef at this point is that to zoom in requires a clockwise turn and to zoom back out counter-clockwise. My other sigma lenses were the exact opposite so I find myself still going in the wrong direction. It is just a matter of retraining myself though. I definitely like the zoom lock but have found that the zoom is not "loose" and the lens does not zoom out if pointed down as I have noticed with other lenses. I would definitely recommend this lens and am VERY happy with it so far. Outstanding OS (up to 4 stops) Relatively fast aperture, fast and silent AF, rugged build,, excellent IQ. I haven't encountered any major flaws other that possible better weather protection, but so far I've not encountered any problems in that area. First off, the Optical Stabilizer (OS) in this lens has given users up to 4 stops of extra handhold ability. No lens maker has gone higher (Nikon has one lens that can match it.) Personally I have gotten what I believe to be 4.5 stops. Amazing. This is a great walk around lens. It stays on my main camera most of the time. It is versatile, pretty fast aperture and great OS for low light. The macro function is outstanding! AS Wembly below points out, the measuring distance is from the sensor to the subject. You can almost touch what you are shooting and have clear, crisp focus. It casts no shadow with the pop up flash. It is lighter than most f/2.8 lenses, but has a rugged build that can be felt when holding and using the lens. It just feels good on the camera. About the only time it leaves my camera is when I need more reach for wild life photography at a distance, like birding or dangerous animals. For that I also have a great Sigma lens. the 120-400mm DG OS, a superb lens. Certainly give the Canon 100-400 IS a run for the money (even though i love Canon lenses, and own several). These two with my Canon 50mm f/1.4 will usually satisfy most of my needs. If you do close up work, work in low light and must hand hold, or work in normal zoom distance, you won't be disappointed with this lens. I have been a Sigma fan way back to my days of taking roll after roll in film cameras. Sigma is getting better and better with each product they put out in a given class. It has a lot of features and versatility at an affordable price. I love it and I'm pretty sure you would too. I've been using this lens for a couple of years now and it has performed flawlessly and with excellent image quality. It is not a burden to carry around all day as it is lighter than most f/2.8 lenses in this class with optical stabilization. It has an attractive look and feel and even though its IQ is slightly less than the non OS version, it is not enough to make a big deal and with up to 4 stops with OS engaged, it is very much worth the slight trade. One lens maker has matched 4 stops, none have gone further. It is one versatile piece of glass. I think most advance enthusiasts, and pros can find much to love and use in this lens. On an ASP-C it is a 27-112 equivalent. While the Canon equivalent has a better weather and dust sealing, at 1/3 the cost you can't go wrong with this lens. While the "Macro" designation gives an added allure, it is not a true 1:1 magnification, but at 1:2.7 at 70mm, it does a pretty good job for close up work. It also casts no shadow when using the pop up flash on my 50D and 60D, although I usually use a Canon 430 Speedlite II. I use this lens for landscape to portraits and commercial work. It works well in conjunction with my Canon f/4L IS for portraiture and weddings. I've owned many Sigma lenses over the years and have rarely been disappointed and this is one I would certainly recommend. A great walkaround lens at a budget price. Does everything better that a kit zoom can. Better wider angle, longer tele,wider apeture, closer focus, better build quality. This lens tries to be good at everything and for the most part succeeds. I always throw this lens in my bag for my extended trips through South East Asia, along with an ultra wide and a few fast primes. This is the one that stays on my camera the most. Great image quality very good resolving ability zero aberration .I work in the camera industry and i tested this out my self with focus charts mirror lock up self timer 2.8 to f7.1 very little modulation ,did not double halo on the edges at 17mm not many other lenses can do this ,i use a canon 7D and this lens is very very good over all .i was able to stack a cir pol on a 8 x ND filter and retain auto focus .The 1:2 macro is just a bonus.Every D7000 nikon i sold went out the door with this lens as well this year i think the 18-105 is not suited for the camera. Nice lens with a decent built quality. I don't understand, why the review here is so poor i guess they got a lemon. Also the macro comment is wrong, they write "just under 9 inches" This is measured from the sensor plane! This lens focusses as close as 1cm from the front element. With manual focus even closer.Closer is hardly possible. I like this lens overall, except for the fact that if you crank up your contrast, blacks and whites during PP, you can see the vignette at 4 corners. It's very easy to see that it appears in most pictures. very sharp pictures at all focal lengths! great for indoor and good all around! great for portriats and flowers! decent close ups and flowers look very good! crops look great also! excellent color and contrast! cant say anything bad about this lens! the zoom is very smooth and no lens creep.love this lens for close up work! works great with my 7d! best lens in 17-70mm class! the os works great! professional quality at very reasonable price! I bought this lens to replace my Sigma EX 24-70 f2.8 and my Nikkor 28-105 f3.5-4.5 as it has optical stabilisation and macro. Good choice of lens for studio work if you like ultra-sharp photographs without any effort. Very solid build. Oddly, it feels quite heavy on the D300 and D200 cameras because of it's short chunky shape but it looks and feels like the EX pro range. The aperture range is evenly spread over f2.8-4, and focusing is accurate and fast with the HSM. The zoom ring doesn't need the creep lock. This lens pairs well with the Nikkor 55-200 VR for blur-free outdoor work.